April 6, 2017 by Ecommerce News. About Mobile, Payments with tags The Netherlands. 7518 views. Online shopping via a smartphone or tablet continues to increase in popularity in the Netherlands. The number of online purchases that happened using the smartphone, grew 68 percent compared to 2015. Now, 9 percent of online purchases in the Netherlands happen via the smartphone, while the tablet accounts for 14 percent. The recent figures were shared by the eCommerce Payment Monitor, a research done by GfK in collaboration with payment method iDeal and Dutch ecommerce association Thuiswinkel.org. 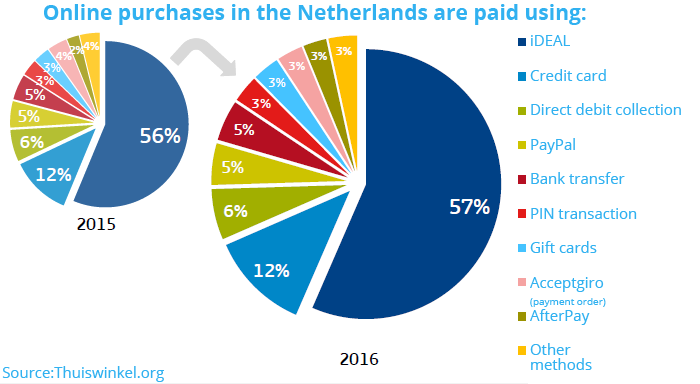 When we just look at the number of online purchases in the Netherlands, the market increased by 22 percent compared to the situation in 2015. Last year, Dutch consumers completed 174 million online purchases. iDeal is still the most popular payment method and saw its market share increase from 56 to 57 percent. The biggest growth in percentage terms however is shown by AfterPay, which increased 49 percent to now have a market share of 3 percent. The use of smartphones for making purchases online continued to increase in 2016 and showed a greater increase (+68%) than the overall online market. But still, the vast majority of online purchases in the Netherlands were made via a laptop or desktop (74%), although desktop is being used less often than last year (from 34% to 31%). The share of the tablet remains stable at 14 percent of all online purchases., but the number of online purchases via smartphones rose to 14.9 million, from 8.9 million online purchases in 2015. This way, the share of smartphones increased from 6 percent to 9 percent of all online purchases.